Ray Boone and his frontyard guests. They had vegan cookouts. They played touch football. Council members stopped by for Thanksgiving dinner. 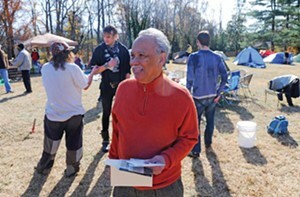 For five weeks, from Nov. 15 to Dec. 20, Occupy Richmond’s roving protest camped out in the front yard of Ray Boone, publisher of the Richmond Free Press, who lives next to Mayor Dwight Jones in the Brookbury subdivision in south Richmond. Boone was at his finest, agitating self. Everyone learned a good lesson. And Jones eventually invited the protesters to City Hall, and they shook hands. Richmond may have its warts, but this wasn’t one of them.